I am not embarrassed to admit that I love gnomes. That being said I shun most garden gnomes because they’re too cute or sickly-sweet. If I place a gnome in my yard it has to be a certain type of gnome. I can’t really quantify the type I like but I know it when I see it. We have a gnome named Fred that reminds us of a former handyman. 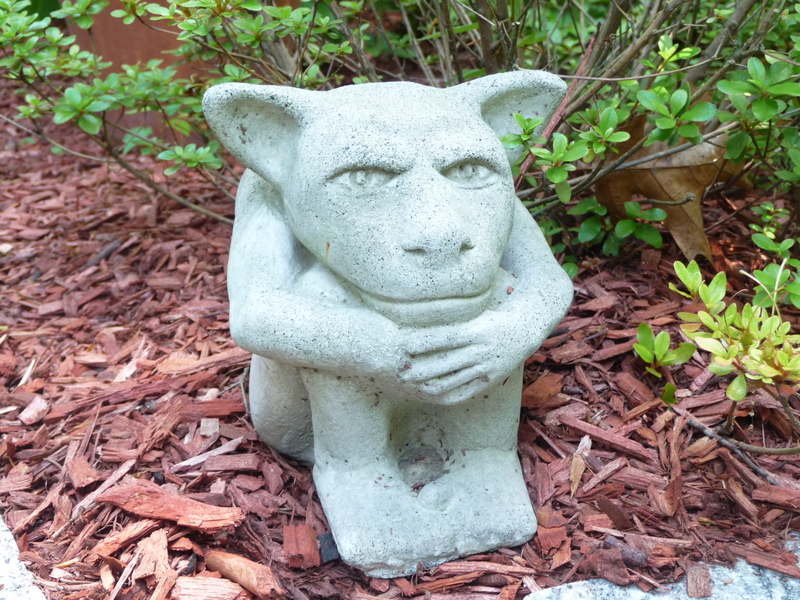 We have a gnome that sits on a bench inside the outdoor shower and we have a small gremlin that guards the front door. When I walk around the lake I take note of what my neighbors choose to put in their yard. Lawn art can usually be divided into one of four categories: religious, artistic, kitsch and cutesy. 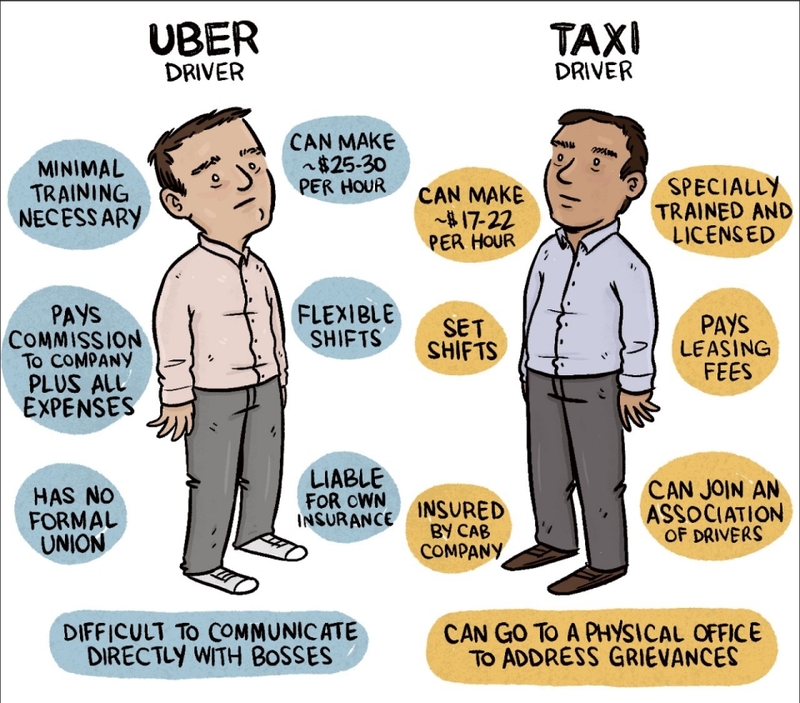 The world can be divided into two types of people. Those who like lawn ornaments and those who don’t. Early this spring we were driving past a neighbor’s house when we stopped the car. There on the street were two cement cherubs.We called down to the owners who were sitting on their deck. We could not believe our good fortune.They easily weighed seventy pounds each and it took both of us to haul them in and out of the car and down the steps. We hadn’t owned them very long before our son, Jackson came to visit and took one of them home for his yard. Apparently lawn ornamentation is genetic as well. When my father-in-law was not working as a house painter he liked to help his wife buy stuff. They rarely took regular vacations. Their idea of fun was to get in the car and drive into the country. “Let’s take a ride, “ Mario would say to his wife and son and off they’d go. “Can you do any better on this?” Mario would probably ask, rubbing his hand over a tiny chip on the edge of a Roseville vase. That was how they acquired large collections of Roseville or Rose Medallion tea cups or carnival glass. They picked up a lot of slightly flawed items that were marked down. Anne never really considered the resell value, she just liked the things she picked out. Mario liked to barter. He never paid the asking price and if the seller wouldn’t come down, even a little, Mario and Anne walked away. He never looked back. There was always more stuff to buy someplace else. Mario was also a sentimentalist. He was a large, very loud, uneducated man that spent his whole life looking for his father’s approval often in the hearts of strangers. For Mario, one of the advantages of having a house full of chipped or scratched antiques was he could give them away. The first time I met him he was trying to get me to take home two bulky green vases that had supposedly been unearthed years before in Korea. Mario knew a man who had sneaked the vases into the United States and then low and behold sold them to Anne and Mario at a loss. “Really?” I asked wondering why they would want their son’s girlfriend to own them. We ended up taking one ugly vase back to our studio apartment in Brooklyn. It was always easier to do at least part of what Mario wanted than it was to dismiss his requests entirely. 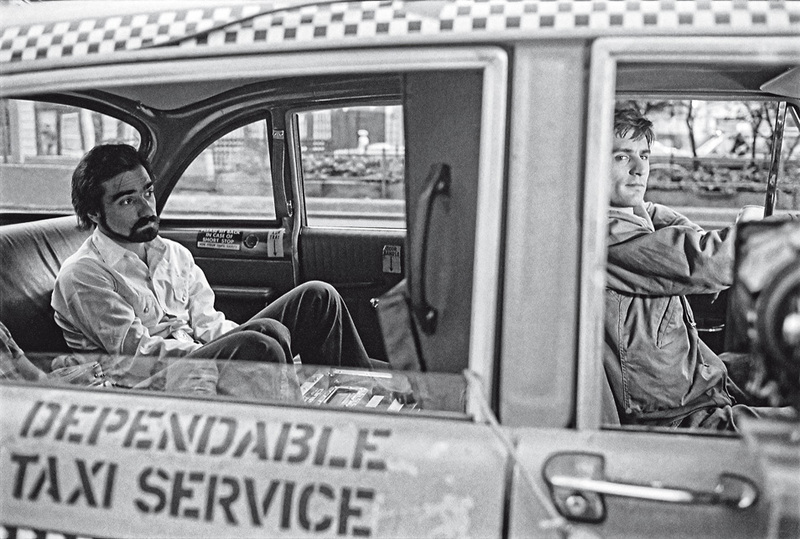 His own father had a large cement donkey in the front yard of his house on East 233rd street in the Bronx. The donkey had two cement baskets hanging across his back that served as planters. 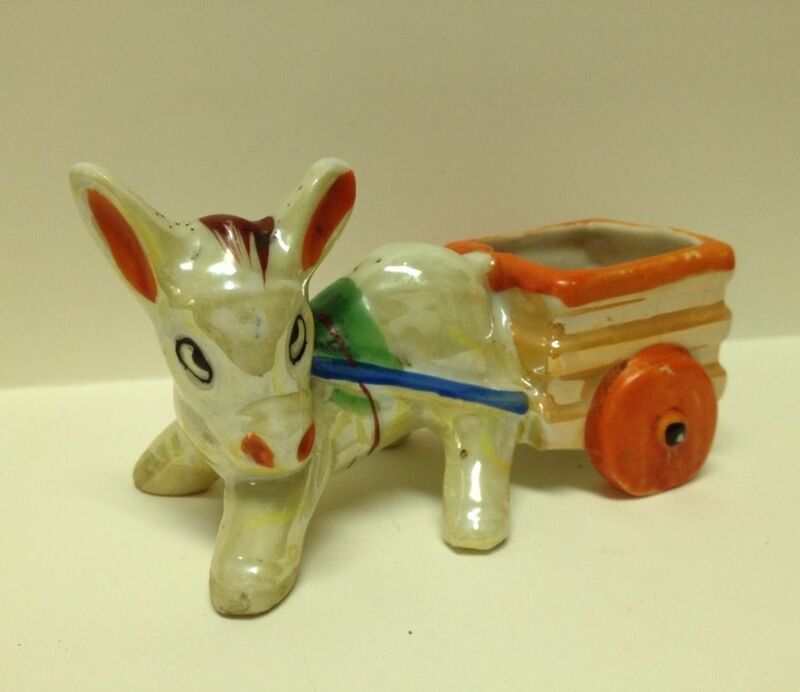 I don’t know what happened to the original planter but years later Mario bought a decorative donkey planter at a flea market. This donkey was meant to stay indoors. The small, white, ceramic donkey with big Bambi eyes was so utterly kitsch that I immediately liked it. When my children were young they liked to sing a song called Dominick the Donkey. It was an old Italian song that Mario knew and hummed along to when they sang it. Dominick also happened to be Mario’s father’s name and maybe the little statue became a substitute for his own deceased father. In any event this particular flea market ware was regarded as something of a pet. After Mario died, the house was sold and Rob and his sister divided up the things his mother couldn’t use in assisted living. Rob and I held yard sales for two consecutive weekends. We sold furniture but we also tried to unload a lot of antiques with flaws. I took the donkey. We had just bought the lake house and I wanted the statue as a memorial for Mario. I placed impatiens in the donkey’s two wee baskets and planted his hoofs into the garden soil so it looked like he belonged. I didn’t care what anyone thought. “That’s Mario, the donkey,” I told anyone who visited. “No, his name is Dominick, “Rob would say. We left it at that. We brought the donkey inside for the winters but the years in our lake yard had not been kind to him. His baskets had both been broken and re-glued several times and he lost a leg. I propped him up against a tree and that worked until he eventually split in half and we had to throw him out. But by now Rob’s sister and my father had died and we had placed lawn ornaments out in their memory too. Rob’s sister, Marlene was memorialized with a cement cat. Marlene loved cats even though she was allergic to them. She once rescued 5 feral cats had them spayed and neutered and they lived in a cat house on her back deck. They made a path across the lawn between her house and her parent’s house because Mario was feeding them cheese everyday on his front step. Who knew that cats ate American Cheese Singles? Mario showing how to hold a cat. Notice the cheese next to him. 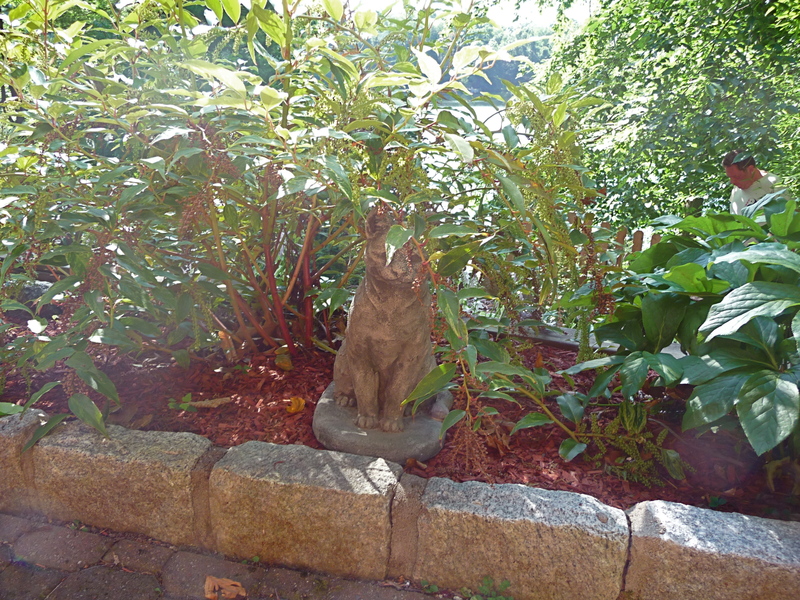 The cement cat is positioned between two bushes on our patio and if you forget the statue is there you can be caught off guard and think it’s real. We always try to choose tasteful pieces that blend in so no one will be able to tell how utterly tacky Rob and I both are. During my father’s funeral, just as the first person began to speak a few words in memory, a terrific wind blew around us in the cemetery. We could see the wind wasn’t blowing across the lake in the distance, just around this small party of mourners. The wind was so strong, we held onto hats and pressed our skirts down and struggled to hear the words being spoken. When the last speaker was finished, the wind cut off like a switch. “Wasn’t that strange,” I whispered to my aunt. “Leave it to Steve to have the last word,” she said. My father’s yard memorial is wind chimes that call out from the lower yard. We kept moving them around to new locations because the chimes were temperamental and it didn’t always chime when it was windy and sometimes chimed when it wasn’t. The new spots didn’t change anything and we’ve pretty much given up control to my dad. When my brother Chris died late last August we were feeling very low and Rob suggested a drive. “Let’s take a ride,” he said. We arrived at a rundown garden shop in Newburgh, New York. The grounds were littered with cement statues in varying sizes and states of decay. We trudged along searching for a donkey replacement along with a garden memorial for Chris. The owner spied us and came over. “How much is this one?” Rob asked pointing at a weather-worn cement donkey. “No,” he said. “Let me know if you have any more questions.” He walked back inside. As we headed to the car we came back around to a cluster of small cement statues arranged on shelves. A small angel was sitting on the end. 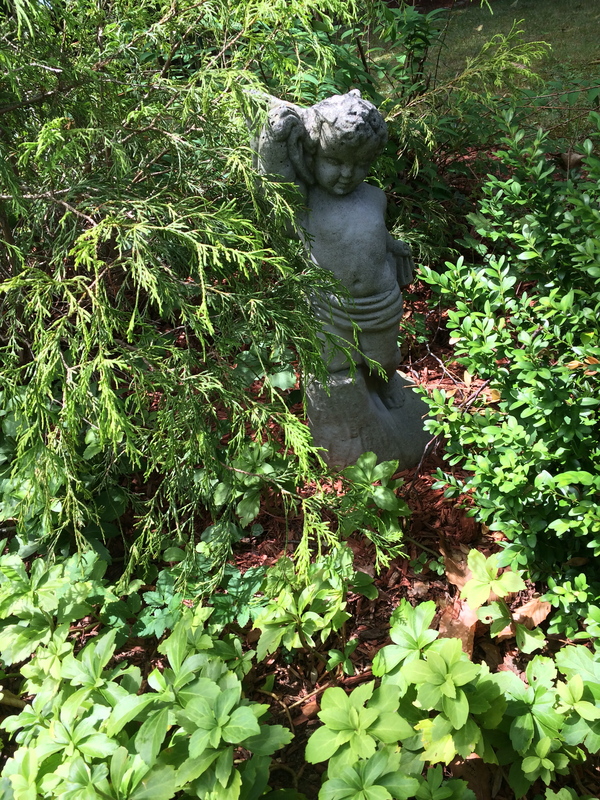 When we brought the angel home we were tired and placed him in the front lawn between two large plants. “We can move him later,” I said. Now, coming up on the one year anniversary of his death the angel is still in the same place. He greets your arrival on the way down the steps and makes me remember Chris on a daily basis, which is precisely the point. Our quest continues to find a replacement for Mario’s memorial. We’ve been online and searched numerous statue shops but nothing seems to be a fit. The donkeys are too big, too cute or non-existent. We found a small bronze bird on top of a red glass ball that seemed perfect for Rob’s mom, Anne. We planted it near the cat. I didn’t press the point. In the end we both knew that only a donkey would do. And a particular sort of donkey at that. You see when it comes to lawn art there’s no accounting for taste. When my mother was raising children I remember she was great at marking time. She understood ceremony and held up a barometer about what mattered to her. Dinner was the most important meal and a lot of tension and energy went into each one. Tables were always set with dishes—never paper—unless you were picnicking. 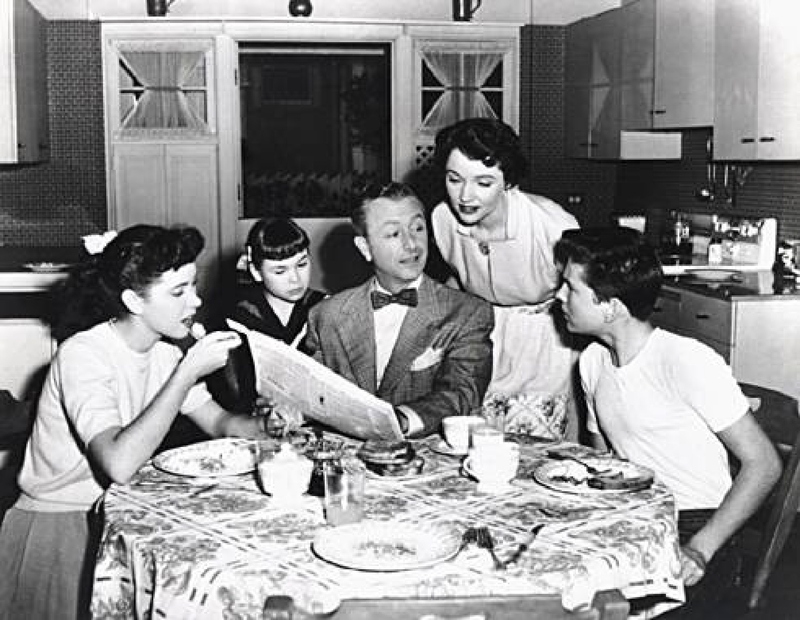 No glass jars or cartons were ever allowed and meals arrived on platters with serving spoons. Time seemed to stop for a few brief hours after all the preparations were over, and everyone took a collective sigh and soaked in the moment or occasion. Holidays and birthdays were magnified under this same barometer of marking time, as if to say: notice this, before it passes for good. Just because another one will follow doesn’t diminish the importance of this one. If you ignore it, knowing that the moment will soon go by, you won’t necessarily miss it but you’ll never understand how you could have appreciated it. Living on the lake offers year-round natural events that fit into this equation of marking time. And nothing is more fleeting or more satisfying than raspberry season. It starts as a few stray berries begin to dot the road or poke through some bramble near the mailbox. This is the beginning of a tiny two week window that offers a bounty like no other. After the first raspberries of the season open, it takes a constant vigil to know when to begin picking. Last week, driving around the lake, it happened. “Let’s go tomorrow,” she said. Just after breakfast we set out on our yearly harvest. After a short walk we discovered an unexplored area next to an old abandoned house down the road from us. “Are you sure we can be here?” Quinn asked, walking cautiously behind me into the overgrown yard. “Nobody lives here,” I said. “That wasn’t my question,” she said. “Look.” I nodded towards an enormous area of bramble glistening with crimson notes, stretching out along the water’s edge. Quinn stopped worrying and started picking. A warm breeze circled around us as we clutched clumps of deep red berries that fell off the vine into our baskets with very little prompting. We picked in different sections of the large patch, so we couldn’t see each other as we talked about the past and recounted the years we had been continuing this tradition. It did not go unnoticed that this would probably be our last opportunity to do this together. Quinn is moving to Virginia in under a month and probably won’t be back home this time next year. 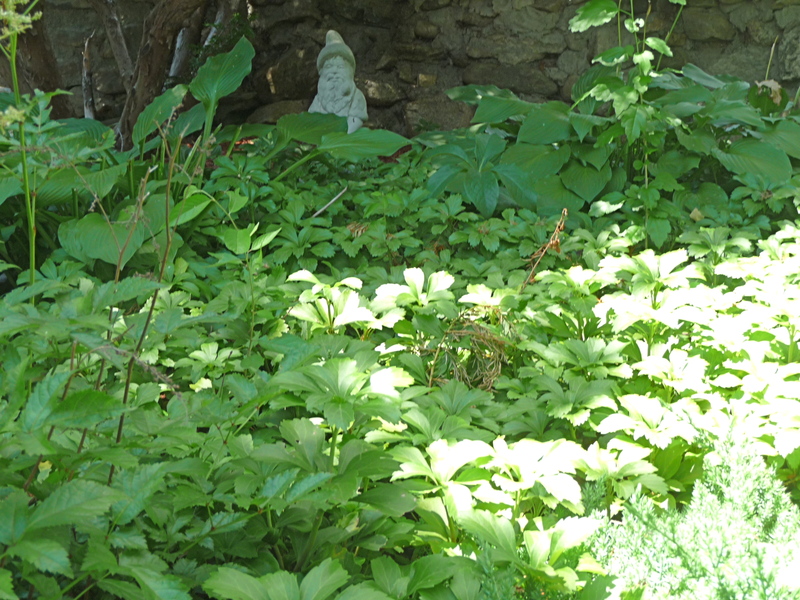 Some years we had a lot of competition for the berries and we have had to be willing to venture deeper into a patch. “That man across the street is eating all our berries.” I would say peering out the front window. “Well technically they’re not ‘our’ berries. He’s entitled to pick some too,” Quinn said. This comment was usually followed by a short pause and a solid plan to get out there and garner our share. Raspberry picking is not for the faint of heart. To produce a healthy and satisfying yield takes energy and determination, plus a few sensible rules. 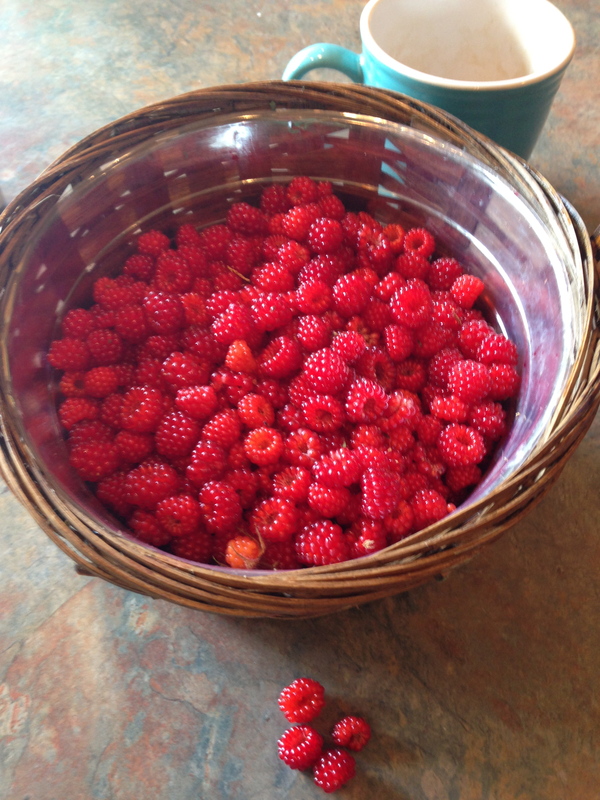 When we first started raspberry picking fourteen years ago, we stumbled for a while. Jackson, Quinn and I dressed in summer clothing and started walking around the lake in search of the elusive food. The picking was easy and we stayed along the edge, picking one by one. Kaplink, Kaplank, Kaplunk into a small pail we all shared. 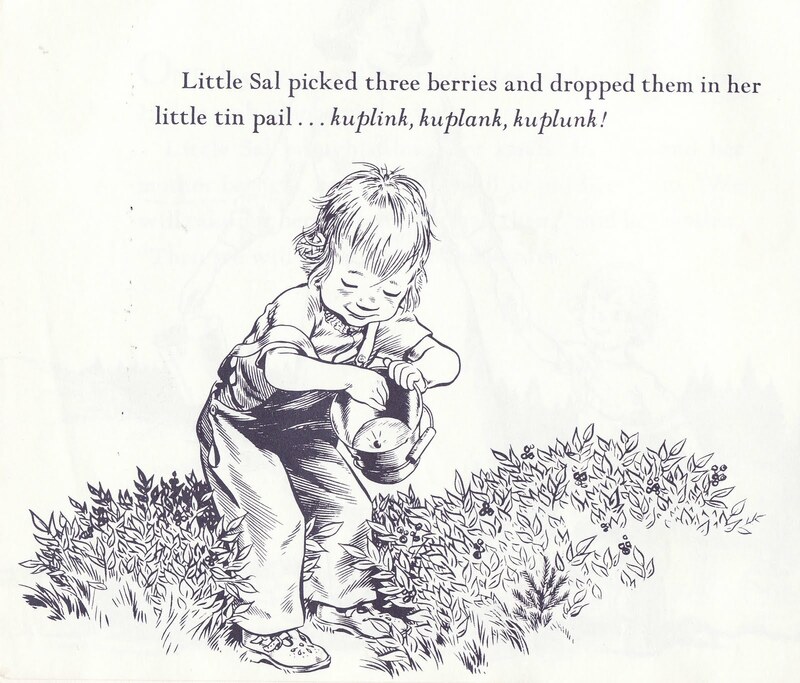 It reminded me of the children’s book by Robert McClousky, Blueberries for Sal. Quinn was always good for around twenty berries before she fatigued or was scratched. Jackson ventured deeper and produced a bit higher yield but after half an hour he would peer into the pail. “Quinn didn’t pick enough,” he cried. Rule number one: everyone carries their own pail, paper bag or basket. The first time we brought the berries home we dumped them into a bowl and placed them on a shelf in the refrigerator, only to discover the small pile of red beauties overrun with tiny green bugs that couldn’t quite figure out what had happened to the warm weather. Rule number two: Immediately fill a sink with clean water. 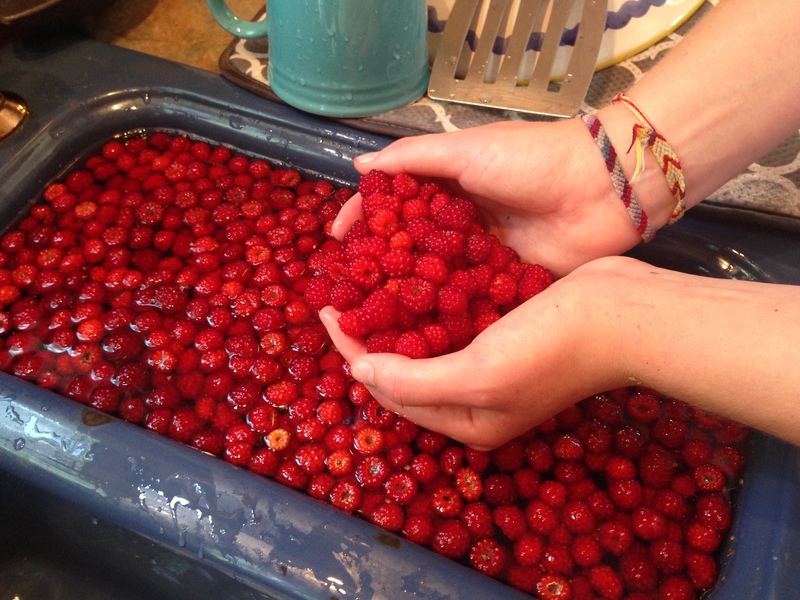 Soak and sort all berries before storing. 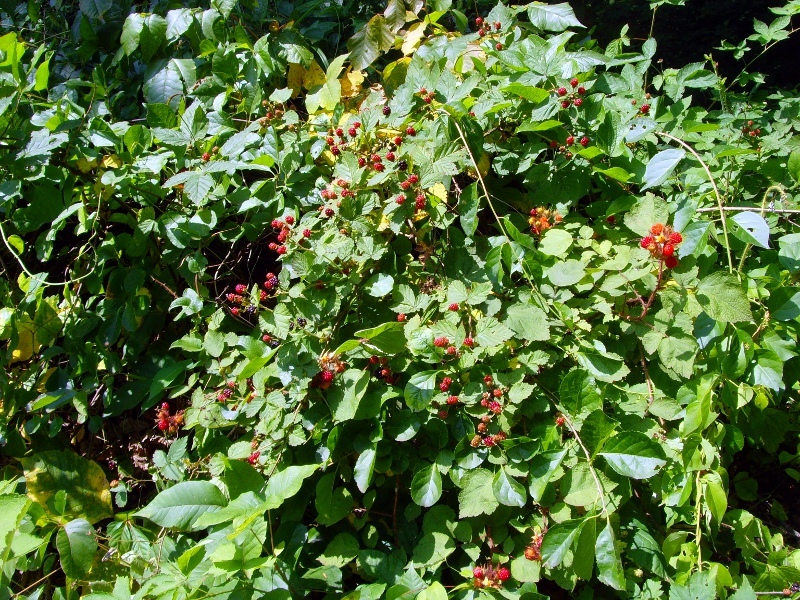 Raspberry bushes like to hang out with poison ivy and they grow on branches that protect themselves with sharp needle like thorns. As the children grew our prowess to collect more and more berries grew. We would emerge with scratches around our knees and ankles and the occasional patch of poison ivy. Rule Number Three: Wear high socks and sneakers, long pants, a light weight long sleeved shirt and a hat. Wearing long pants and sleeves in July can be quite uncomfortable in itself so always try to rise early in the morning before the sun gets too high and pick for about an hour. Anything longer can diminish any pleasure that might be achieved during the experience. Once you return home, enjoy a swim or if possible an outdoor shower to flush away any residual stickiness. 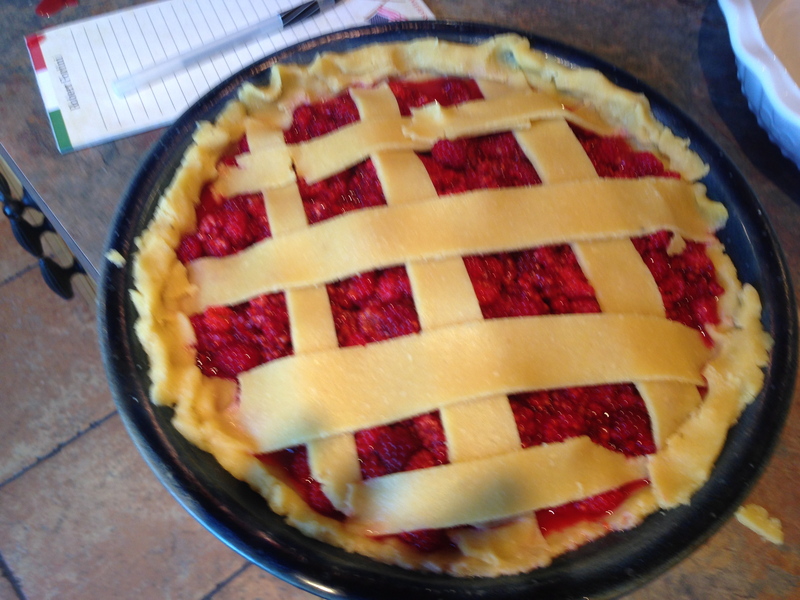 Once the picking and washing are complete the decision on what to bake fills the kitchen with delicious anticipation. If the berries are picked early and they have a predominate orange color, then jam with added sugar is your best bet. But if the color resembles garnets, then fresh over ice cream or yogurt is the way to go. 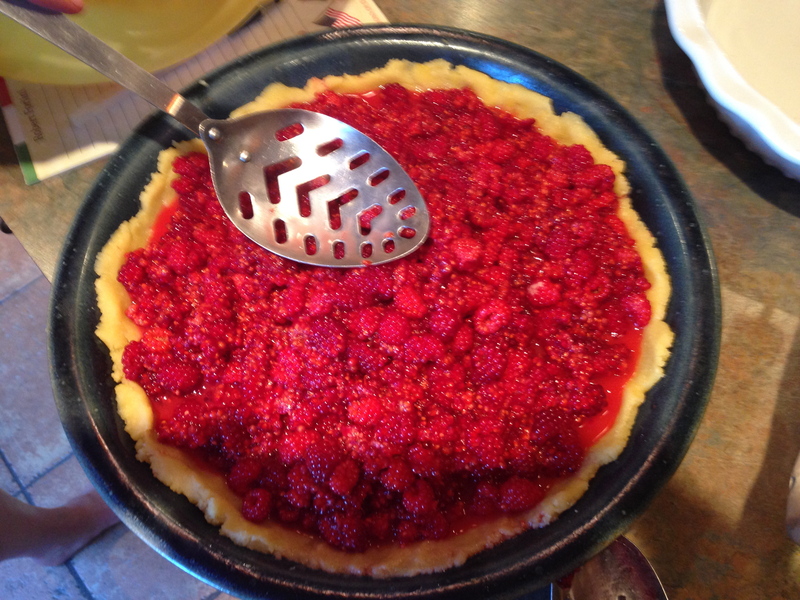 Having a large colander full of clean wild raspberries can yield two jars of jam, a pie, muffins and several days worth of fresh berries for breakfast. In our house there was initially a bit of a squabble over who picked the most and who was entitled to more. This comment usually elicited a reference to The Little Red Hen story and Rob would raise his hand in a solemn pledge. 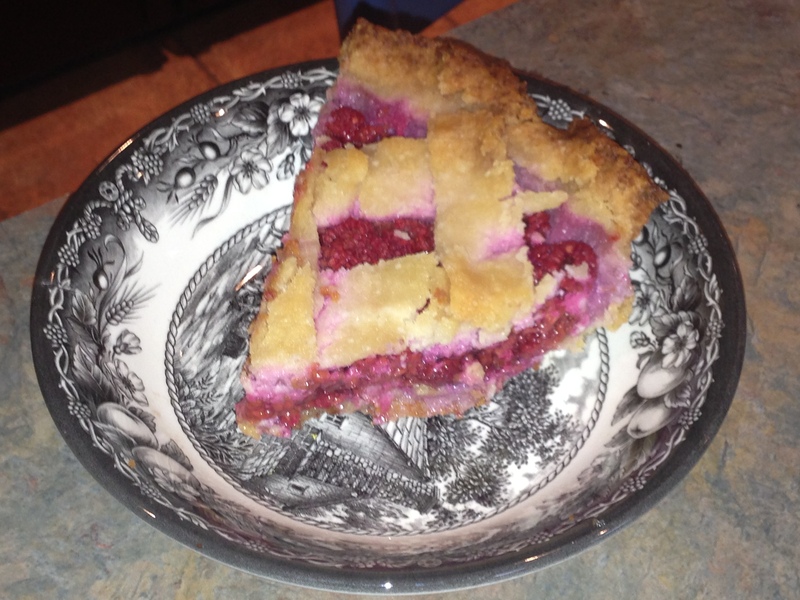 “I’ll wash the dishes.” It’s an easy promise to make when the last piece of wild raspberry pie is staring you in the face. But really that’s the best part about picking: sharing. We looked forward to returning home, dumping our full paper lunch bags into the collective pile, and listening to Rob or whoever happens to be visiting coo. “Right?” we all agreed, exhaling our collective sigh, really pleased that someone else understood our efforts. Rule number Four: Always share your bounty—it makes it all the more rewarding. I’m glad we have house guests right now because you need a willing audience to help you mark the time. In another week it will be gone. Elana’s raspberry Bars. I have linked the image to the recipe for your enjoyment. You can use the store bought variety.